This is part of the M2M Series, The Big Move from One House to Another with Three Kids…Successfully: A 4 Part Series. To read the other parts, please click here. I feel like I’ve been living this selling/buying/moving chaos for so long, I had to chronicle it for the sake of others…whether it is for sheer comical entertainment or the remote possibility that there might be some nuggets of wisdom to glean from it. Doubtful, but I’ll leave that up to you. If our realtor wasn’t already a rock star for helping us find a buyer for our home within three months of listing and then enabling us to secure our next house just hours after it went on the market, she certainly kicked it into high gear when it came to closing. 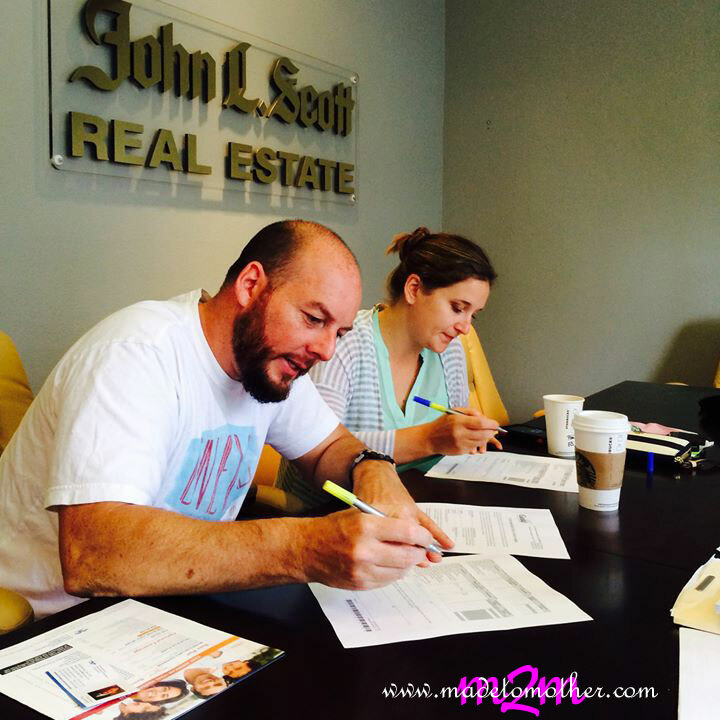 Both homes used the same title company, so we were able to lock in a closing date on the same day for each. Our agent recommended giving our sellers a week after closing to move and negotiated with our buyers for two weeks. That was nice, I thought, because there wouldn’t be much stress or work to do other than packing until closing, right? Oh. So. WRONG! There were disclosures, inspections and appraisals still to navigate, and I was told that many sales fall through during these points. Thankfully, most everything went smoothly with the disclosures for both houses. For the inspection, I had to take our kids out of the house for three hours only four days after our home was pending so the inspector, the buyers and their agents could nitpick and find every tiny thing wrong with our house. My husband and I were so stressed! What if the roof leaked and we had no idea all this time? What if there was mold in the attic? Are there cracks in the foundation? How much money were we going to have to shell out? The suspense was unbearable. And what was worse, we didn’t even get a copy of the inspection. So we waited with baited breath for what they would ask us to fix. Days went by and we didn’t hear anything. Was this a good or bad sign? The waiting was agonizing! Finally, a day before their inspection deadline they contacted our realtor (long pause for dramatic effect). They asked for three things. Yup. Only three! A home warranty, a new lock on the rear sliding glass door and carpet cleaning after we move out. That’s it. After all was said in done, it came to less than $500. I couldn’t believe it! And then it was our turn for the inspection on the home we were purchasing. I was glad for the excuse to visit again, take some measurements and look at things I had forgotten at the showing. We hired a sitter so my husband and I could have three hours at the new house without them. What I was not prepared for was meeting the sellers! They waited and hung around for an hour just to chat with us about our family, home specifics, and to answer any questions we had. It was very sweet. They were an older couple, very pleased to hand over their loving home to a family who would care for and appreciate it as much as they had over the years. I completely understood, because I wished the same for the buyers of our home. After our inspector did his thing, we sat down and he walked us through the big stuff. And boy was there a lot! After all, it was built in 1940, and since the listing had said much was “newer,” we thought we were getting a steal. In actuality, the agent was fudging on quite a bit. There was some poorly lined areas on the low-pitched “new roof,” evidence of rodents and pests in the crawlspace, and below-par caulking and seals on the “newer” windows and siding. Also, the “newer” furnace and water heater really weren’t, and there were (gulp) cracks in the foundation. Now the question remained, would they fix all these things for us? Were we getting ourselves into a money pit? My husband and I talked about it and compiled our list of must-have repairs. It was extensive, but we also left off a lot we knew we could do ourselves. We felt what we were asking for was fair since we were giving them their asking price, and waited anxiously, again, to see their response, hoping it would be as kind as they were in person! We went back and forth three times on the repair negotiations until our realtor suggested just getting together in person to discuss everything. She had a suspicion that much of the problems were coming from their realtor, and this was confirmed when we sat down and met with them. The agent was on her phone the whole time and only looked up long enough to threaten backing out over a $400 home warranty. Thankfully the sellers reined her back in and we were able to settle on a reasonable compromise to everything on our list. Afterward, the sweet homeowners gave me a hug and wished me happy packing. When the stress with inspections and repair addendums was over, it was appraisal time. Both the homes we were selling and buying were for asking price, so we were a little worried if one or both wouldn’t appraise that high. Again, I stressed and bit my fingernails waiting to hear what the results would be. In the meantime, we were down to two weeks until closing and three weeks before we would be moving, so I HAD to start packing. I scoured Craig’s List for free moving boxes and made lists of everything we needed to sell and things we needed to buy. If you don’t know me well, let me tell you right now that I am super-duper, type A, obsessive-compulsive crazy list-making lady. It gives me a sense of control in a world full of chaos; and believe me, moving with three kids, two dogs and a husband that works long hours is literally the definition of chaos! But making those lists and planning out moving week worked like a charm to calm the stress that was building the closer we got to closing. At four weeks out, I began packing up pictures and décor on the walls, photo albums, books and extra linens. This was also the point where we held a garage sale and began selling larger items on Craig’s List, which freed up even more space for boxes. Three weeks to the move I called and booked appointments with professionals that we’d need help from…carpet cleaners, maid services, contractors, etc. I also packed extra toys and board games the children didn’t care about, and the décor and pictures on their walls. I kept a small case of favorite movies out for the kids and the rest of the DVDs went into boxes. At two weeks I confirmed with friends and family that would be helping us move or watching the kids. We ordered and scheduled delivery of furniture and appliances for the new house and packed up nonessential bathroom, kitchen, office and bedroom stuff. 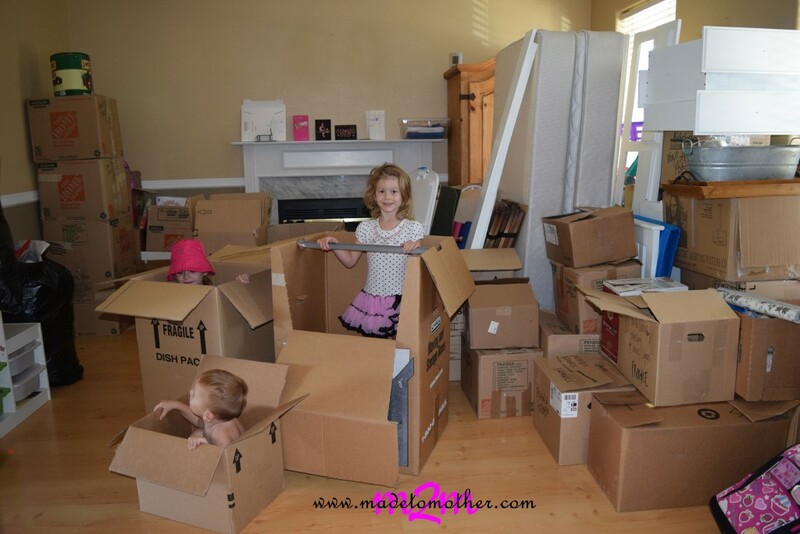 The house was really starting to look lean and the staging areas were full of boxes! Regardless of the size we still wanted the house, but we were extremely irritated with this completely unethical agent who had been so unprofessional and misrepresented much of the house already. We believed it was providential, though, because if the house had been accurately listed at 200 square feet smaller than our current home, we probably would have never even looked at it. So, after talking a long time about it, my husband and I asked the sellers for more in closing costs, and in return, took off all the repair requests we had originally made. One week out from moving day was our closing date. We got another sitter and spent an hour signing paperwork on both houses. Then we waited for escrow to record. Minutes, hours and a day dragged on slower, it seemed, than when we were waiting for an offer on our home. But by the next day it was official! We were renters in our old home and landlords of our new home! Now it was time to really pack. Into boxes went more essential things like all kitchen, office and bedroom stuff we wouldn’t need for a week. My husband packed up the garage and we stopped grocery shopping, trying to eat as much of what was in the pantry, freezer and fridge so we would have less to move. This was the week that we also began switching our internet, utilities and garbage service from the old to the new house and scheduled our mail to forward. I knew once we moved, we would be swamped with all the other address changes we would have to make, so whatever I could do in advance I did this week, before things got REALLY crazy. Finally, the day came when we had keys! We got another sitter and went to work changing locks, painting and planning where furniture and new appliances would go. Our hired professionals also came in and did their thing. The following day with the kids at a theme park with a friend, we started moving. Since our new house was literally five minutes from the old, my husband didn’t want to rent a moving truck. Instead, we made about a million trips back and forth between houses with boxes, smaller furniture and random items in pickup trucks and the family minivan. For the larger furniture and yard stuff we rented a flatbed trailer and had the most important stuff moved with the help of family that first weekend. But, like most things in life, everything took longer and was harder than originally anticipated. The sellers weren’t out of the house on time, we couldn’t finish all the painting the first day, and a few of our helpers had to back out last minute. Thankfully, my husband took the next week off so we could make a million more trips between houses before it was our turn to vacate. And even though the kids had school during the day, we still had much to do in the afternoons and evenings. We enlisted their help as much as we could; helping us unpack their own boxes in the new house and clean up the old house. Eventually the time came to say our goodbyes to the place we lived our entire marriage and our children had called home since birth. It was bittersweet, but as a family, we were ready for the next adventure in our new home! —> Read Part 4: Settling Into Our New Home, a Big Sigh of Relief, and a Summary here! Moving is quite the adventure. Your system was good to have a central place to leave the packed boxes, and to take wall hangings first. Being able to see some items on Craig’s List was also helpful. All in all your post told it all, the good bad and ugly, but all turned out well in the end. Thanks for sharing with us here at Tell me a Story. Thanks for sharing your story! Quite an experience! Thanks for linking it up at the Thoughtful Spot!